Since strangers contact me wanting to know how I got my first job in tech after working in the art market for years, I realized the steps I took could be very helpful to spell out for people in the same situation as me a few years ago. So if you are thinking about getting into tech, read below -- I decided to write down here everything I know about getting your first tech job as a career changer. But then I realized, however, that I had almost 40 years of work ahead of me, so settling in my career in my twenties would be a very bad decision for the long-term, even if it meant throwing away my art world career I’ve built up. Select your age in the dashboard below to see how many years you’ve got left before retirement. So even if you’re 45, you still have half of your working life ahead of you! It’s really too early to settle even at age 55 for 12 years of a job that doesn’t make you excited to get out of bed in the mornings and pays you a great salary at the same time. Because this is a massive post, I've listed the topics below in a table of contents so just jump to what you're most interested in. So why get into the tech industry? Do I have to learn how to code to get into tech? What's the best Life motto to have while getting tech skills? How do I know which tech skills to get first? WHAT'S THE BEST WAY TO GAIN TECH SKILLS? How do I make time for gaining skills while working a full-time job? How long will it take before I'm ready to get my first job in tech? How can I get hands-on experience without ever having done tech before? What's the Number One Mistake people make when trying to get into tech? How do I market my new tech skills? I’m ready to start. What’s the very first step? What if I need more support to get my first tech job? Have you heard of digital nomads who work winters in Bali or Goa and summers in Berlin or Barcelona? Or maybe you want to have kids and be able to work from home to make your kids, not work, the center of your life? In the tech industry working remotely aka away from an office is a reality. Power To Fly helps women freelance from anywhere in the world. If you want to see the survey for yourself, go to StackOverflow. Three developer colleagues of mine just have to dial in for our daily 15-minute meeting and show up in real life about once every 3 months. So working in the tech industry allows you to work where you choose and when you choose. What I really struggled with in the art world was a lack of choices: it is a niche industry where everyone knows everyone. When all your potential bosses know your current boss, it makes job hunting impossible to be subtle. Also, there simply weren’t so many opportunities because the industry was so small. Even though these numbers are from the US, this is a global trend. 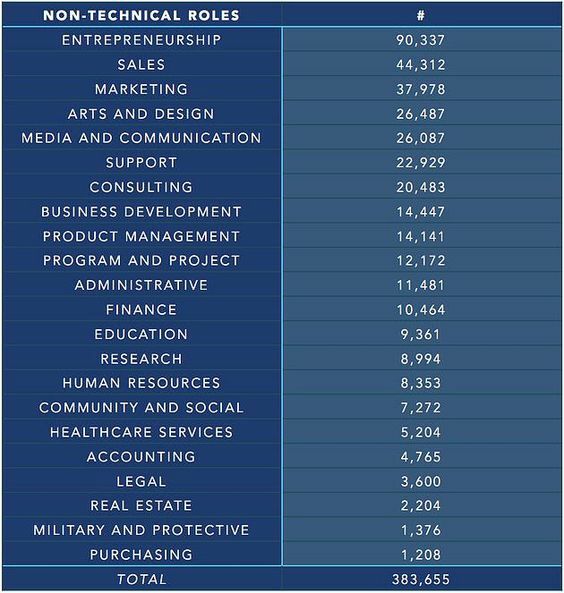 So there are definitely lots of jobs in the tech industry. In 2013 a survey said that the average tech salary tops $85,000 in the US, which is basically twice as much as the median salary for art history graduates. As a beginner you probably won't get paid as much as the average, but when I moved into the tech industry, I refused to take a pay cut--and I started at a higher salary than my senior position in the art world. Part of what excites me about tech is that I am learning all the time. In fact, I’m rewarded by my industry if I continue to learn and grow. If you prefer routine, there are still tech roles for you, but the industry as a whole is built on innovation and change, so the jobs themselves change over time. For example, if you're an iOS developer, when Apple introduced a new programming language Swift for iOS development, then you have some time to learn Swift and switch over from the old programming language of Objective-C. But if you don't learn Swift at all, maybe in a few years time there won't be any jobs for Objective-C programmers for iOS apps, see? Anecdotally, quite a few people I know become front-end / user interface developers after being graphic designers for a while. Personally, I got into tech as a product manager with a BA and a MA-equivalent in Art History. Tam Eastley got a job as a junior developer with a degree in Cultural Anthropology with a minor in Greek and Roman Studies, which she had parlayed into a job as a journalist. You can read about her career path as a success story from Rails Girls. Click here for more examples from Skillcrush. Let’s get one thing straight off the bat: there are non-programming jobs within tech, so if you don't want to be a web developer or software engineer, that’s fine. If you DO want to become a developer, software engineer, or coder, read the next section about how to gain tech skills. Jeremy Schifeling, who runs the website Breakinto.tech that tells you how to break into tech, ran the numbers on over half a million jobs on LinkedIn and found that for every programming role in the tech industry , there are 3 roles that are non-technical. That means in the tech industry they need even more non-programmers than programmers! In conclusion, you don’t need programming skills for all jobs in tech, but mastering the basics of tech will help you understand the core of the tech business: software that helps people do something they want so much they’re willing to pay for it. So even if you want a non-technical job in tech, it helps to gain some understanding of how software works by getting some coding skills. What’s the best life motto to have while getting tech skills? This is Marie Forleo's life motto. What Marie means by "figureoutable" is that you can figure out something new. You can pretty much learn everything via the Internet today. And that’s an advantage as well as a disadvantage, because in the glorious, wide open world that’s the internet, how do you know what to focus on first? In order to focus and not get distracted by shiny new candies / technologies, even before you even start gaining programming skills, figure out which tech skills you want to focus on first before deciding on how to get them. Once you decide to uplevel your tech skills, you’ll notice that there is a cornucopia of resources to help you...like in a candy store everything looks good and tempting. So how do you narrow your focus and decide on which tech skills to get first? Start with the end in mind. Let the job you want guide the skills you need to get. Taking it a step further, try acting as if you already had the job: If you already had the job you wanted, which skills do you need to improve now? For example, if you already were a data analyst today, which skills do you need to improve now? Maybe you'd like to learn how to query data in Hive or how to use a statistical tool like R to help with statistical analysis. You may wonder how could you act as if you already have the job when that's exactly what's missing from your life? My mentor Hilary Rushford taught me one secret to her million-dollar success: instead of having something on the outside being the prerequisite to doing and being something on the inside, being something on the inside is the prerequisite to doing and having something on the outside. For example, maybe you think you need a tech job in order to be a real techie, but actually to become get a tech job, you have to feel like a real techie first. In short, instead of have > do > be, it is be > do > have. Practically that means to change your situation, first you work on your mindset so that you can act as if you already are on the outside who you already are on the inside. Be who you want to become so that your actions come from a place where you are already the new you. Only when your actions change will you have different results. Because the only way to get different results is to take a different set of actions then what you’re currently doing. Who do I have to be to get the results I want? What do I need in order to accept that I am already who I want to be today and stop waiting to become it someday? As Bobbie Barrett from Mad Men said: "Pick a job and then become the person that does it." So after you figure out which skills you want, what’s the best way to gain tech skills? Self-directed learning is where you assemble your own curriculum from different online tutorials or follow along a book to learn specific topics on your own. If you need help, you can turn to online forums like StackOverflow or CodeNewbie. Some self-directed learning books like Daniel Kehoe’s Learn Ruby on Rails does help a beginner go from no programming skills to building a real-world application, but most books or online tutorials don’t. Online courses have designed their curriculum in a logical order so that you can achieve something tangible at the end, usually some sort working real-world application or product. What makes online courses shine compared to self-directed learning are the community and networking. For example, some online courses have a forum where you can ask code coaches and other learners for help, so if you’re struggling with a concept, you have a ready set of people willing to help. Also, some online courses will help you get hired either because they’ve built relationships with employers or because the course even guarantees you a job or your money back like Udacity’s Nanodegree Plus. By immersive bootcamps and project groups I mean where you regularly meet with other learners and a coach at a scheduled time regularly, mostly in real life but sometimes online only. IMHO, this is the best way to learn because there can be a dialogue between the coach and learners, so your learning feedback loop here is the fastest. That is, you get direct and immediate feedback whether you’re getting the idea or not. And as soon as you don’t get it, you get help from the coach and the other learners on how to course correct, so you’re never far from the right path. In the US alone, there are 67 full-time bootcamps lasting an average of 10.8 weeks and costing an average of $11,063, not to mention the cost of moving temporarily to the city of the bootcamp as well as your living expenses during these 11 weeks. If you decide to go for a bootcamp, Course Report collects reviews from real students of all the bootcamps so you can decide for yourself which one is right for you. But this immersive way of learning doesn’t have to be expensive. Nor do you have to quit your job to get it. So my personal recommendation for learning how to code is to combine an immersive project group with some self-directed learning. Decide on deadlines by which you’ll achieve small goals to give yourself a sense of progress. Prepare for the times it might get uncomfortable and don’t let that get you off schedule. Realize that discomfort doesn’t mean unhappiness. Discomfort simply means that you’re in the process of evolving, so it’s totally normal to feel lost sometimes or recognize how far you still have to go. Brianna Wiest writes about 16 uncomfortable feelings you’ll encounter as milestones when you’re evolving yourself. You can get more complicated than this by breaking down your big goals of getting different skill sets into smaller goals, setting deadlines for each smaller goal, and planning out the amount of work you’ll do each day in order to reach each smaller goal. But in my experience I get so into the planning that I have even less time for the actual work of learning and getting new skills. So if you’re short on time, plan just enough so that you get things done and don’t plan more than you really need. Anecdotally, I know people who get a tech job within one year having gone through a weekly study group. For example, Anita and Tam below both got developer jobs within one year. Click on their photos to be taken to their Rails Girls' interviews, where they share their journey to getting their first tech jobs. As for graduates of a full-time immersive coding bootcamp, 78.99% find jobs within 90 days and 88.77% of students find jobs within 120 days. Since the average time investment of a full-time coding bootcamp is 10.8 weeks, that means about 90% of graduates from a bootcamp find jobs in 6 months or less, including the time invested in the boot camp. Of course, it really depends on you and how you learn as well as your background. You’re ready for a real world work as soon as you’re able to do something in the real world. I’m still making this mistake myself: I’m not documenting what I’m learning as I’m learning it. Basically, whatever you’re learning and doing in tech, you want to be able to showcase your finished coding projects as well as document your works-in-progress so that you can show future employers what you can do. So often people only want to show their best work, but employers also want to see the progression you’ve made since tech is a field that demands that you learn and adapt to the times. I recommend showcasing one or two projects as highlights, but if you can show your progression from beginner to advanced beginner to intermediate programmer, even better. Documenting as you go may feel like a chore, “one more thing to do on your list,” while you’re learning how to code, but if your end goal is to get a technical job at the end, you’ll have to document what you’re doing some day before you get a job. And documenting while it’s fresh in your mind is so much easier than two or three months down the line. Trust me, this is my current case right now as I write this, as I realized that my recent coding projects were always in pairs, so I sometimes pushed the code to GitHub and sometimes my coding partner did. Sigh. And the best thing is that by documenting your new coding skills, you are also marketing them at the same time. Why is this awesome? As soon as you can show people what you can code, they can ask you to code something similar--so that you start getting paid to code. See below for more information about making websites. So you’ll never have to ask yourself: When am I ready for my first paid tech job? So what’s the best way to document your skills and projects? An “About Me” Page / Bio to memorably introduce yourself. Links to your social media accounts so that they can connect with you on LinkedIn and Twitter. An optional blog to show what you’re passionate about or to explain a concept you’ve learned in coding or a recent coding project. Resume or categorized list of career highlights, such as speaking engagements, certificates for online courses, awards, and other achievements. Contact Info, either your email or a contact form. This way, you only have to create a bio page, a coding project page, and a contact form from scratch for your portfolio. How can I get hands-on experience and build my portfolio without ever having done tech before? Five ideas for you, all of which are just stepping stones, so get your first experience and build from there. Look for opportunities at your current employer, if you’re currently employed. For example, one of my ex-colleagues Amanda was working in customer support and occasionally helped one of the junior product managers with testing her maintenance releases when things got slow. She eventually became a test engineer at another company. Work for cheap...for a limited amount of time. Get paid for something small as soon as you learn about it, especially for tech work. You can get paid as soon as you know something that someone else needs, no matter how basic it is. You don't need to wait until you know everything to be able to help people with their tumblr site or create an email template for Mailchimp using CSS and HTML. This won't be your dream job; just get some paid experience, add it to your work portfolio, and use that to move forward. Build your own website. One idea is your portfolio site to showcase your technical work. More on that in how to market your work below. Building something from start to finish helps you hone your real-world skills, demonstrates initiative, and gives you a project to discuss during an interview. Work for free as an unpaid intern for one day per week or however much time you have...but for a limited amount of time. Approach some small business and offer them to do a website for free or some small amount of money. Try to solve some real problem for them, like keeping a list of appointments or orders, or collecting feedback from customers. Nothing beats the ability to solve reliably even the simplest real world problem. But don’t make it a toy project, make it like your life depends on it. You’ll never look like an idiot after even one real world project. After three you’ll look like a pro, after five - like an expert. If people are happy with what you’re doing an willing to pay you for what you do - you’re a professional. Even if you don't think you need a resume or CV, as a career changer, you have to tell the story of how what you did before contributes to your new role. You have to make the connections for other people, because only you know your skills and achievements and can explain their relevance to your future employer in a new industry or domain. Documenting all my relevant skills and accomplishments on one or two sheets of paper helped me prepare for the interview as well as gave me the confidence that I indeed have valuable experiences to offer, even in changing careers. Just add your best and most relevant work to your resume / CV and cut out the rest of your work history that doesn’t apply to the job you want. Most recruiters spend 10-15 seconds scanning each resume, so don’t put anything on it that doesn’t show how you’re qualified for the job you want--not the job you had before. Tell your story of how you got from your previous career to the one you want. This last one is my favorite, as your "career change" just seems like a natural outgrowth of your current path, even if you’re feeling like you're making a huge change. Your resume / CV has one goal only: show recruiters that you are qualified for the job so that you get invited to an interview. You have to brag about your skills and accomplishments in your resume / CV, even if it makes you feel uncomfortable. If you don’t brag about your skill and accomplishments, how will anyone know about them? So quantify your achievements, drop brand names when applicable (“gave a talk at Google”), and highlight the most relevant skills and achievements using industry keywords so that in those 10-15 seconds a recruiter spends looking at your resume, it will be loud and clear that your skills, experience, and ability to learn will allow you to perform the job you want. In addition to a resume / CV, you can also collect tangible evidence / demos of your work in a portfolio to show, not just tell, about your work. Good thing you’ve been documenting your tech skills, because you’re now set with the right tangible proof of what you can deliver. Since you decided which skills to build based on the job you want, your portfolio will show that you are indeed qualified for the job you want. Instead of focusing solely on building up my resume / CV, I also focused on networking to land my first tech job. Job opportunities come through PEOPLE. People, not faceless companies, hire people. I was not alone in this: 70% of jobs are found through networking, and 40% of job seekers say they found their dream job though a personal connection. If even the idea of networking makes your palms sweat (mine do as I'm typing this! ), consider networking as an opportunity to help people and create community through that service. The key is to help people without expecting anything in return from the person you’ve helped. Once you help someone, you've started the first step of a good relationship with them. Do that for 10 people, and you've created a community around you. In doing this, you’ve expanded the circle around you which will eventually support you when you need it, if it's easy and fun for others to help you. So pay it forward and build relationships by adding value. What’s key is that you see everyone whom you help as a peer, not “under” or “over” you. Once you do get invited to an interview through your awesome resume / CV and networking, prepare for it by practicing. Describe a challenge or conflict you've faced and how you dealt with it. What's your biggest strength / weakness? Why do you want a change from your current career path? Where do you see yourself in [X] years? Why are you interested in our industry? Career Contessa, where I got these questions, even has the perfect answers to these questions. Sounds kinda harsh, I know, but the truth is people want to work with people they like because they’re going to be spending at least 40 hours a week with this new hire. Between two equally qualified candidates, the one people like better will be picked because they will also work better with the team. So the first step is to decide on what role you want, based on which you’ll know the skills you need to get it. After you know which skills you need, try out a free online tutorial to see if it’s really a good fit before you decide to invest more time or money into a paid online course or immersive learning setup. While you’re learning, document what you’re learning by pushing code to GitHub, making screenshots of your projects for blog posts, and adding to your online portfolio. Even before you feel like you’re ready, start marketing your skills by updating your resume / CV and networking while practicing for your interview. Career change is mostly about self-confidence. If you need more support during your career transition, I am working on a course to support you with the soft skills of getting your first tech job. Sign up below to be on the VIP list where you’ll be the first to know once it’s ready as well as get some exclusive bonuses, like a step-by-step map to getting your first tech job as a career changer so that you can track your progress over time. Check your email to download your step-by-step roadmap.